Does “The Cat Groomer” continue her education at all? Cheryl has taken advantage of many grooming shows that offer continuing education seminars and learning opportunities. It’s always good to keep up with new products & techniques that make cat grooming safer and more effective for clients and their kitties. The Cat Groomer’s policy is to allow a two hour appointment time slot the first time she meets any cat for the first time if a full groom is being provided. This allows time for the cat to become comfortable with what is being done without the groom having to be rushed. The groom may not take up the entire two hours but it’s better to have more time and not need it than to be needing more time that was not scheduled. Once we have worked with your cat we will be able to provide you with a more accurate time span for future appointments. I have been told that my cat is difficult to groom. Do you give cats sedatives to calm them down? We never give any cat any medication as part of the grooming process. If your cat can only tolerate grooming “with a little help” that is something cat parents can speak with their veterinarian about. The vet will know their cat specifically and can recommend courses of action or medication that could be used, but anything that is recommended by the veterinarian must be administered by the pet parent. The Cat Groomer does not administer medication. Having said that, we do like to see even difficult cats without any medication on the first visit. This will allow us to see the cat without it being “chemically altered” so we can better assess what the cat’s issues may be. A cat can be difficult for many reasons: fear, aggression, or simply inexperience. Because of the specialized handling techniques that we use, it may be possible that safe grooming of a difficult cat can be accomplished without the use of medication. But that can only be determined if your cat is first seen “au natural”. Can I stay and watch my cat being groomed? This is not The Cat Groomer’s preferred policy for a number of reasons. Animals can be very similar to young children in that they can act differently when they believe their parents are around to “save” them. As your cat’s beauticians, we would like the opportunity to bond with them throughout the entire grooming process to build the trust that is essential to ensure a long and happy grooming relationship. When the cat is always turning around to face their parent the groom cannot proceed efficiently and the trust relationship does not get off on the right paw. Fortunately, we are located exactly in between Keene, NH and Brattleboro, VT, both of which have many opportunities for shopping or dining while you wait. 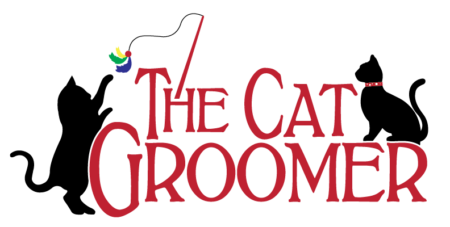 In season, we would also invite you to take advantage of “Purr & Putt”, our partnership with Pine Grove Springs Golf Course, which is within view of The Cat Groomer’s salon and walking distance away, although you can certainly drive there if you wish. Hit some balls on the driving range, practice your putting, or enjoy a 9-hole round of golf. Kitty should be just about ready by the time you are finishing up! Rental clubs are available, or bring your own! What forms of payment does The Cat Groomer accept? At this time only CASH or CHECKS made payable to “The Cat Groomer” are accepted forms of payment.